Dr Ahmad Al Tunji is a specialist in urology, general surgery, paediatric, endoscope and infertility treatments. He has worked with Al Razi Hospital – Syria as a Urologic Surgeon and has served at the Aleppo Private Hospital as a Specialist in Urology Department. Dr Ahmad also had the opportunity to offer his services at Al Ryad Hospital for treatments In Vitro Fertilization (IVF) and Intracytoplasmic Sperm Injection (ICSI). In addition, he also been an instrumental member working with varied other hospitals as Al Hekmah Hospital, University Hospital; Al Kindi Hospital; Ibn Rushed Hospital and University Hospital. 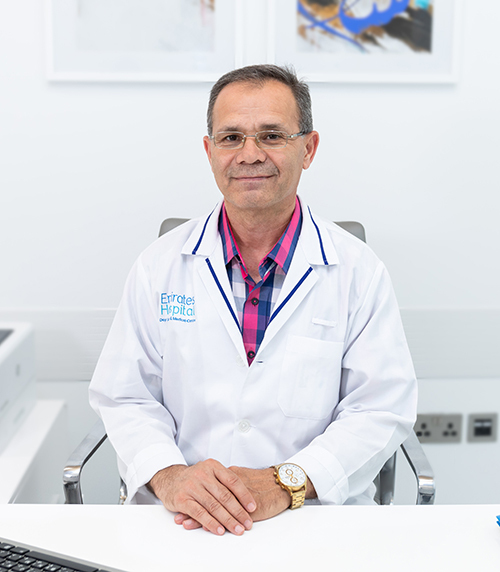 Visit our family at EHDSMC and get to know more about Dr Ahmad and how he can cater to your health needs.